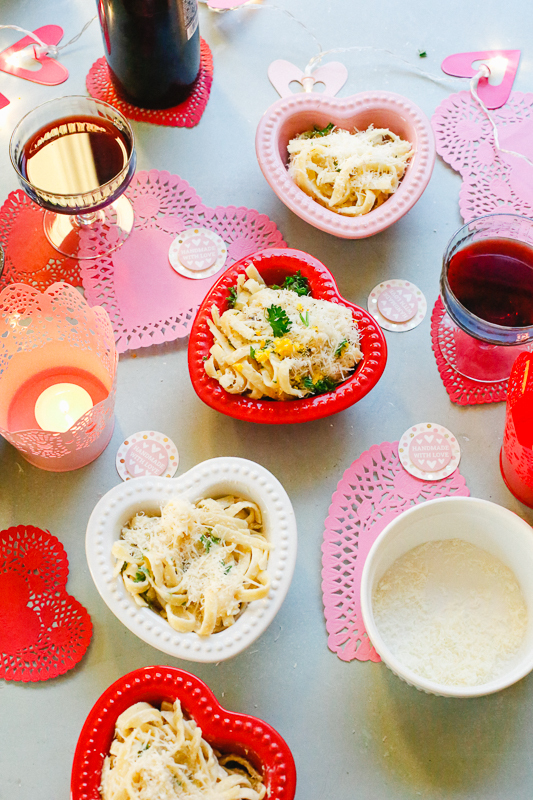 One Pot Fettuccini Alfredo | Easy Valentine's Day Dinner For Two — Welcome to Fitty Foodlicious! 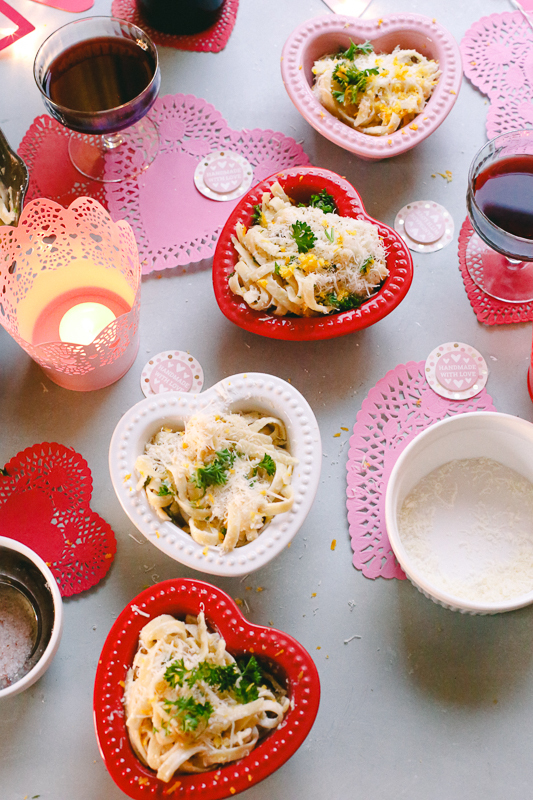 Stay in this Valentine’s Day and make this easy one-pot Fettuccini Alfredo pasta recipe for two. This recipe uses fresh, real-food, creamy, delicious ingredients and is a pasta dish you can make in less than 15-minutes. Now, break out that bottle of wine or sparkling water and enjoy the perfect night in for two! Valentine’s Day is just around the corner, and restaurants are known to jack up the prices because of the infamous love holiday. Why not stay in with your sweetie and create the perfect Valentine’s Day meal at home? 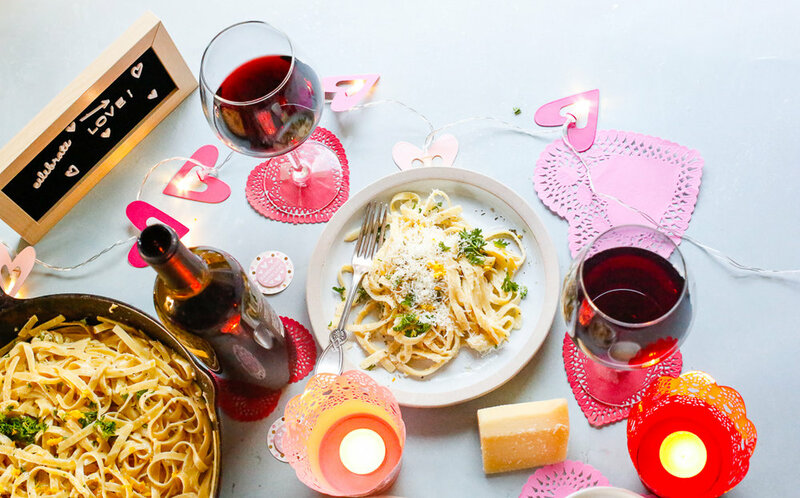 I’ve partnered up with Raley’s to bring you a series of the easy, Valentine’s Day meals that you can shop for locally and surprise your honey with right at home. Raley’s has relaunched their private label program and I’m so excited because the products are not only of high value and affordable, but they are also made with real food and ingredients that you can actually pronounce. I picked up my favorite items at my Raley’s in Folsom and it was a breeze! I love how helpful all of the employees are. What’s nice is that I can always expect to recieve the same high-quality, friendly customer service. 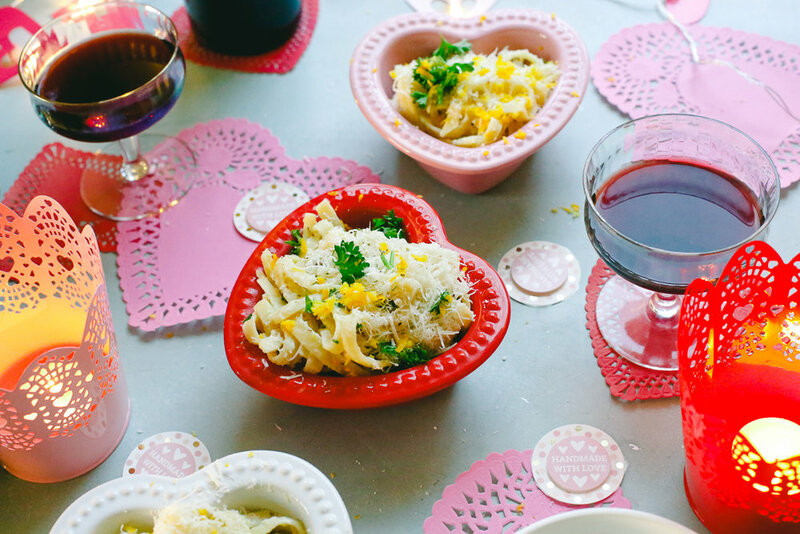 The first recipe in my series of Easy Valentine’s Day Meals is my One Pot Fettuccini Alfredo featuring all Raley’s Brand products. Now let’s get to cooking! Pasta is an easy meal option that can be whipped up quickly and is really fun to make with your partner in the kitchen. I picked up my favorite pasta items at my Raley’s in Folsom and opted for items from Raley’s private label. We are making homemade Fehttuchini Alfredo, and here is the grocery list you will need for this easy, delicious meal. I’ve linked everything here so you can easily access the delicious foods from Raley’s. You can even order all of the items directly on the Raley’s app for pick up or delivery. How cool is that? Here are the items you will need for this delicious recipe. This is easy one pot Fettuccini Alfredo, so all you’ll need are the above ingredients and one pot. I’ve opted for a cast iron skillet, just make sure it’s deep enough for the water and pasta. Once the pasta has boiled to al dente (about 8-10 minutes or so), reserve one cup of the pasta water. Mix the rest of the ingredients into the pan, add some fresh parsley, parmesan and lemon zest (optional), and you’ve got yourself perfect one-pot Fehttuchini Alfredo. See the recipe below for more details. To make this a complete Valentine’s Day dinner for two, add a bottle of wine or your favorite sparkling water, a salad for two and my easy Chocolate Ganache Tart Dessert, which I’ve linked here and also features all Raley’s Brand products. The Chocolate Ganache Tart is made from scratch and probably one of the best desserts you’ve ever had. What are your plans for Valentine’s Day? Do you prefer to stay in with your honey and cook for your loved ones? I know we will be staying in this Valentine’s Day and whipping up this delicious dinner for two! And stay tuned for part two of my easy Valentine’s Day meal series hitting the blog soon. This post is sponsored by Raley’s. All thoughts and opinions are my own. Cook fettuccine in a cast iron skillet in boiling salted water, according to package instructions, until al dente, about 12-minutes. Reserve about 1-cup of cooking water; drain pasta. Add the pasta back to the skillet and add the past water, heavy cream, organic egg, butter, and olive oil and combine. The egg acts as a thickener to the pasta sauce and makes it extra creamy. The pasta water cooks the egg. Add the Herb’s De Provence , chopped garlic, fresh parsley, and combine again. Add the fresh parmesan cheese and more fresh parsley if desired. Top with Salt and Pepper to taste.